Emerging market demand for local foods represents an interesting phenomenon, as small-scale direct markets operate side by side in communities with much larger competitors, such as food supercenters, which also seek to procure locally grown produce. Moreover, the wide spread differentiation of food offerings and venues has allowed consumers to more carefully search out attributes that are important to them. These attributes may include any labels or information on private—such as quality, safety, and health—and public, such as social fairness and sustainability—assurances, some of which may be more closely associated with local foods by consumers. 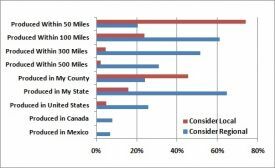 In this article, we explore the underlying factors that motivate consumers to choose local food and how motivations vary among buyers in different market venues, based on a national survey administered in late 2008. The data for this study were collected through a web-based survey, administered by a third party contractor, Knowledge Networks. A total of 1889 primary grocery shopper panelists were invited to participate in the survey, 1268 of whom responded, resulting in 1052 eligible responses representing a 55.7% response. Since the target population was the primary grocery shopper in the household, the sample looks different from the national population, primarily with respect to age and gender—older age groups and more females. 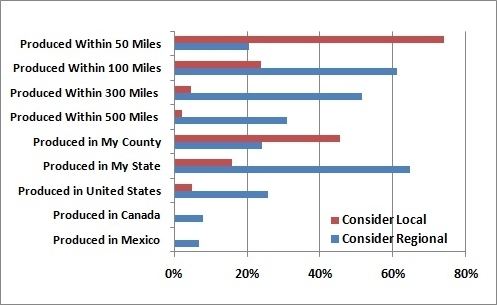 The sample was balanced across regions and rural vs. urban areas. The sample was somewhat different than the national population with respect to several other demographics including Caucasians, higher educated respondents, and higher income households. The rationale for this study is highlighted by the finding that purchasing local fresh produce is extremely common. The vast majority of respondents (82%) said they have bought locally grown fresh produce, only a small group (7%) said they have never bought locally grown fresh produce and the remaining consumers were unsure. On the other hand, the number of respondents who reported buying organic fresh produce is lower than that of locally grown fresh produce; slightly above 50%, while a little over 30% said they have never bought organic fresh produce. When asked about fresh produce that is both locally grown and organic, close to 40% said they have bought locally grown, organic fresh produce, suggesting some complementarities between those segments. Yet, it is important to note that consumers are varied in how they define the term “local” (Figure 1), and this raises one concern about local foods: what are the real assurances about source of production or other perceived characteristics? In contrast, the role organics have played in specialty food niches may be at a comparative disadvantage given the relatively looser definitions and requirements to label local foods. Thus, the growth trajectory for local food sales may be steeper based on fewer supply constraints. What factors do consumers consider when choosing fresh produce? Although traditionally mentioned factors such as eating quality, food safety, and health benefits continue to be of importance, there is increasing evidence that some consumers intend to also make civic and society-focused statements with their purchase decisions. In this survey, respondents were asked to rate various factors, regarding both private and social dimensions, in terms of their importance to buying decisions. As one may expect, the factor “proven health benefits,” had the highest percentage of consumers who assigned it great importance. 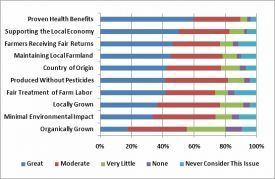 In contrast, the next three most important factors, “supporting local economy,” “farmers receiving fair share of economic returns,” and “maintaining local farmland” could be framed as more altruistic motivations related to public goods consumers want to support. 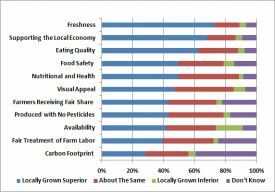 Although these factors might be associated with locally grown—an issue explored later—the broader “locally grown” attribute was rated lower. Despite its significant market presence, organic was rated quite low in importance by consumers, which is consistent with the lower market penetration reported earlier. 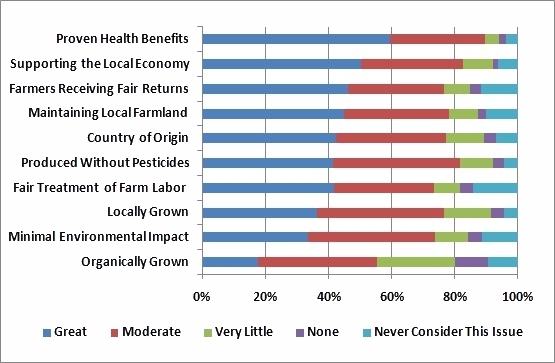 These results support the concept that consumers are seeking direct assurances on specific “outcomes” such as supporting the local economy, farmers receiving fair share, maintaining local farmland, and fair treatment of farm labor, rather than more complex or multi-faceted claims, such as locally grown, organic, and minimal environmental damages. How do consumers perceive quality of locally grown food compared to that of domestic products? Which quality dimensions tend to be associated with locally grown food, thereby differentiating it from other U.S. products? In the survey, we asked respondents to share their perceptions on how fresh fruits and vegetables that are grown locally compare to those produced domestically, but not locally. 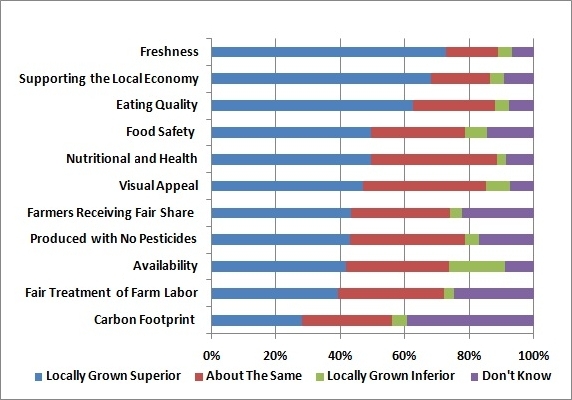 Figure 3 shows that local produce was considered superior in many of the product private dimensions—freshness, eating quality, food safety, and nutritional values—by most consumers. Availability was the only common weakness noted for local produce. In the public realm, consumers also perceived local produce to be superior, or at least the same, in terms of supporting the local economy, and to a lesser degree, providing fair returns to farmers. Note that there is still relatively low awareness about carbon footprint and treatment of labor claims among respondents. To compare, survey respondents were also asked their perceptions on fresh produce, both domestic and imported. The results indicate that consumers do not differentiate domestic products from imported products as much as they do between local and other domestic products. Only the freshness and food safety of domestic produce was considered relatively superior by the majority of consumers but nothing about domestic produce was considered inferior to imports by over one-third of consumers. Do Motivations Affect Where Consumers Shop? Local food is available in various venues, and some of the venues are logically associated with certain assurances. For example, results indicate that those who choose direct venues have their local community as the primary concern, while natural store shoppers have somewhat broader concerns, such as environmental impact and pesticide use. To explore a broader set of market-dependent consumer behavior, interdependency between respondents’ primary and secondary sources of fresh produce and motivations were explored. 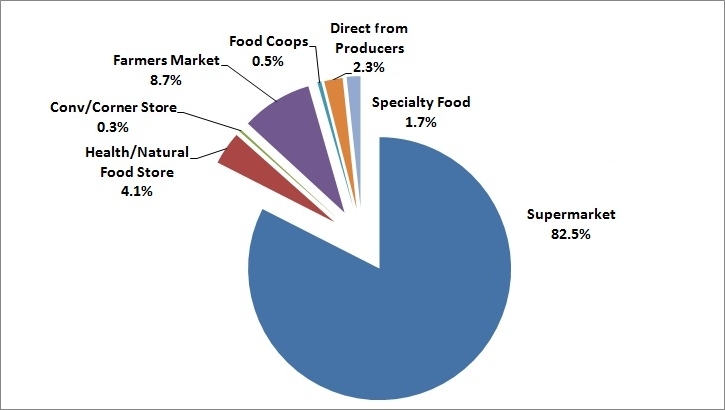 In reporting their primary fresh produce sources (Figure 4), the majority of respondents (83%) reported supermarkets as their primary source while farmers market and direct purchases from farmers had small but significant shares (9% and 2%, respectively). More notably for the focus on local foods, 33% and 8% of the U.S. households use farmers market and direct purchases from farmers to procure at least one-quarter of their produce, respectively. This complements the earlier finding that local foods are a common purchase for households and provides insight on why the USDA has significantly increased programming efforts to support such marketing channels (see http://www.ams.usda.gov/AMSv1.0/farmersmarkets). The importance ratings presented in Figure 2 were revisited and analyzed after segmenting consumers based on their primary shopping locations shown in Figure 4. Patterns point out that those who shop directly from farmers and at farmers markets are also strongly supportive of the local economy and maintaining local farmland compared to those who shop with natural food stores and supermarkets. In terms of the environmental impact of production and produce grown without pesticides, those who shop primarily at natural food stores were most concerned, followed by direct and farmers’ market shoppers. The ratings for “farmers receiving a fair share of economic returns” and “fair treatment of farm workers” turned out to be similar among shoppers in different venues. Motivations, as measured by importance of issues, are one consideration, but perceptions of the impact of buying behavior on affecting those issues is a more complex aspect of consumer behavior. Do Local Consumers Perceive a Role in Affecting Food System Issues? Figure 3 shows that the majority of consumers assign either great or moderate importance to factors such as “supporting local economy” and “locally grown,” yet, they vary in their choice of shopping venues as shown in Figure 4. In fact, over 90% of respondents who purchase the majority of their produce directly from farmers indicate either great or moderate importance to “locally grown”, but the percentage is also over 70% for primary supermarket shoppers. Therefore, to further explore what motivates consumers to choose a certain shopping venue, we draw on the Theory of Planned Behavior (TPB) from the consumer psychology literature (Ajzen and Fishbein, 1980). Considering the TPB in the context of locally grown food, other motivating factors that may influence buying behaviors—what important people in their life think or do, perceived availability of local food, and perceived effectiveness of their action—were considered. Perceived consumer effectiveness is a consumer psychology measure of the degree to which consumers believe that their actions make a difference to private or public outcomes, such as improving their health or supporting the local economy. Our data show that consumers who primarily shop in direct channels, such as farmers markets and direct from farms, report stronger influences from people in their life, stronger belief that their actions matter, and higher perceived availability of local food, when compared to nondirect shoppers. We also found that consumers who primarily shop at niche markets− such as health/natural foods store and direct markets such as farmers’ markets− had a higher sense of effectiveness of their action than those shopping primarily at supermarkets. This could be explained by more transparent information flows between buyers and sellers, an ability to track progress on outcomes, perhaps by noting more traffic in the local downtown area, or stronger belief in certifications when combined with education and promotions at the market venue. This study continues a line of previous work focused on consumer perceptions and behavior related to a variety of food issues. Here we find that a notable share of consumers value and think highly of locally grown products compared to other domestic products. Based on local and direct food buyers’ relatively higher concern about the importance of protecting local farmland and supporting the local economy, this could be seen as a signal to policy makers regarding the relationship between the interest in local foods and public values. In short, policies to support local and direct markets seem complementary to efforts to preserve farmland and reinvigorate local economies. In essence, it is a truly grassroots effort involving a primary basic need using local natural resources to drive community economic development. Yet, markets are complex systems, so competitive forces, constrained seasons and supplies, and convenience still present challenges to those buying and selling local foods. In terms of buyer motivations, the integration of consumer psychology into this work helps to explain the complex array of issues that might influence various market behaviors. We conclude that venues may interact with various motivational factors to influence consumer perceptions about the trust, assurances, and societal implications they receive from making local food choices. This is a fairly undiscovered intersection of consumer sciences. Yet, this study shows such research is warranted and essential as “local foods” go mainstream into a wider variety of marketplaces where certifications and marketing programs may need to supplant the direct conversations and relationships that smaller, direct local food supply chains afford. Ajzen, I., and Fishbein, M. (1980). Attitude-behavior relations: a theoretical analysis and review of empirical research. Psychological Bulletin, 84, 466-487. Bond, C.,Thilmany, D., and Keeling-Bond, J. (2008).Understanding consumer interest in product and process-based attributes for fresh produce. Agribusiness: An International Journal, 24(2), 231-252. Vermeir, I., and Verbeke, W. (2006). Sustainable food consumption: exploring the consumer “attitude-behavior intention” gap. Journal of Agriculture and Environmental Ethics, 19(2), 169-194. Yuko Onozaka (yuko.onozaka@uis.no) is Associate Professor, Department of Economics and Business Management, University of Stavanger, Stavanger, Norway. Dawn Thilmany McFadden (thilmany@lamar.colostate.edu) is Professor and Extension Economist, Department of Agriculture and Resource Economics, Colorado State University, Fort Collins, Colorado. Gretchen Nurse (gretchen.nurse@colostate.edu) is Postdoctoral Researcher, Department of Psychology, Colorado State University, Fort Collins, Colorado. This study was funded with support from USDA-CSREES NRI Project #2008-35400-18693 and the Colorado Ag Experiment Station.